Corresponding Secretary, Angel Smith, reported that a thank you note was sent to Kay Reilly for the OC Reads display and to Jeff McGranahan for his technology help during the Author Luncheon. A thank you was also sent to Carolyn Lothian for her piano playing and prayer. A get-well card was sent to Nicolette Mirra. Two birthday cards honoring Frances Keenan’s 105th birthday were distributed for members to sign. Cheryl Kelchner suggested that everyone send Frances a card on her January 4th birthday. Babs Stefano motioned that we send her flowers. Sandy Crescenzo seconded. Motion passed. Library Representative, Leslie Clarke, reported on the Active Shooter Training held at the library. Ed O’Neal and Robert Wilk from Camelot Security conducted the workshop. She stated that in active shooter situations people should run, hide and fight. The need for a building plan was stressed at the meeting. Joy Fleckser stated that she recently learned of a need for active shooter kits to be available in rooms to supply tourniquets and other first aid supplies to be used while locked down. She suggested that it may be something the organization could provide. Leslie Clarke also announced that she will be e-mailing invitations to the F&V Holiday Luncheon. It will be held at noon on Monday, December 10, in Room 111. The library will hold a Holiday Festival on Sunday, December 2, from 1:00 – 4:00. Membership: Patti Phillips reported that 40 out of our 72 members were in attendance. There were five guests: first time, Harriett Fiore, Daria Solhanchak-Teti, Karin Wren, and Wendy Doerrmann, second time, JoAnne Blackwelder. She distributed and reviewed the committee activity enrollment forms and instructed members to check the re-new or new boxes next to the committees they are interested in. Book Room/Book Sales: Jeanne Pless reported that there is a need for book sale volunteers on Saturday, December 8, from 12:00 to 2:30 and for clean-up. Since the children’s room has programming, non-fiction will not be taken out and children’s books will be placed in the atrium. 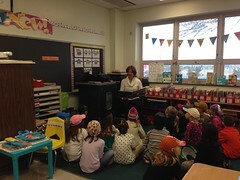 Special Projects: Barbara Riggione reported that the two day writing workshop was held at the Intermediate School. Pam Hepner and Debbie Moreland attended. 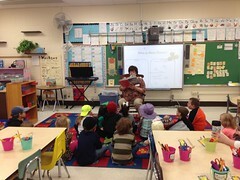 The students were well behaved and attentive. About 200 students were served. 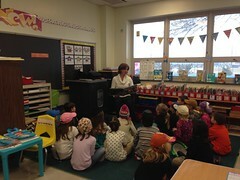 Each student received a book, and materials were left for the teachers to use. Author Tea/Luncheon: A thank you was extended to all by Joan Sambucci and Pam Levis for their support in organizing the luncheon. A follow-up meeting was held and suggestions and recommendations are ready for the new chairs. Hospitality: Volunteers gave out materials and sold books during National Friends and Volunteers of the Library Week. F&V brochures were distributed and may attract some new members. A library table was also staffed by volunteers during Welcome Night. Baby Bags: Pauline Kretzu reported that Sharon Cattie and Linda Robie will package and that she and Jean Bush will deliver the baby bags this month. She thanked members of the committee and noted that Bobbi Taylor will head the group next year. The plan is to have those packaging the baby bags also deliver them. First Day of Kindergarten: Linda Robie reported that 90 bags and coupons were prepared and delivered to the school for the 73 students enrolled in kindergarten. At the end of October, when leftover materials were retrieved, 19 bags and 24 gift certificates were returned. Seventeen gift certificates have been redeemed so far. The school sent out a notice reminding parents of the gift certificate. They have until the end of November to redeem. Publicity: Linda Robie reported that the book sale flyer went out to all media outlets, online calendars and community lists. Special Events: Babs Stefano sought volunteers for the First Night family craft event to be held in the atrium. Two shifts, (5:00-7:00 and 7:00-9:00) of 3 people each are needed. Volunteers will get a free First Night button. 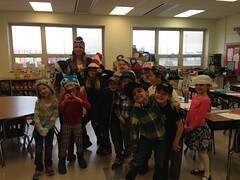 Read Across America: Kathleen Woodring stated that she would be asking for support in January to prepare for the event. Around 20 readers are needed, as well as, people to prepare bags that contain a book and bookmark for each Primary School child. 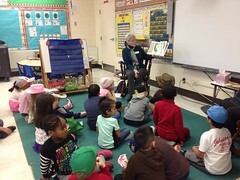 Third Grade Reading Club: Kathleen Woodring reported that teacher, Peg Dunner, will run the program monthly from October to April. 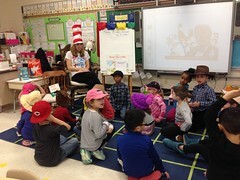 Parents and their children will read one book per month and discuss it. Sixteen students will participate on the third Thursday of each month. Because of Winn Dixie is the first book. The next book will be assigned on November 15. Special Projects: Cheryl Kelchner reported that 4 new signs to advertise the book sale are on display. Dot Mongo joined the committee and will do the bulletin board displays. A collection of turkeys from Leah Costigan is currently on display. Next month, Karen Mahar’s collection of nativities will be displayed. Reading Trees: This month, Marge Roth prepared the trees with Thanksgiving and Pilgrim themes. Elaine Novello will prepare the trees next month. Dot Johnson and Elaine Novello will chair the committee next year. Anyone interested in joining the committee should see the new chairs and sign up for a month next year. The slate of officers 2019-2020 was presented for a second reading. The slate presented was the following: President, Chris Wilson, Vice President, Patti Phillips, Recording Secretary, Joyce McNeely, Corresponding Secretary, Jean Bush, Treasurer, Evie Bachich and Directors-at-Large, Kathleen Woodring and Debbie Moreland. Debbie Moreland opened nominations to the floor. No new nominations were suggested. Nominations were closed and the slate was offered for a voice vote with a motion by Bobbi Taylor and seconded by Marge Roth. Motion passed. A motion was made by Carol DeMill and seconded by Pat Levis to contribute funds to help defray some of the cost of the library staff’s holiday gathering. Motion passed. Debbie Moreland asked that a motion be made to support funding of the 2019 Historical Museum Summer Camp. Elaine Novello motioned that a donation be made to the Historical Museum for their summer camp program. Bobbi Taylor seconded. 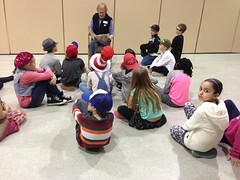 During discussion Sharon Cattie noted that in support of our tradition to advocate for literacy some of the donation should be ear-marked for the purchase of books for the participants. Motion passed. A check will be issued in January. Debbie Moreland invited all current and incoming board members and committee chairs to the next executive committee meeting on Wednesday, December 5, at 9:30. It is the budget meeting and all annual reports are due at that time. Noting that this was the last general meeting for the current board, Kathleen Woodring extended thanks to the board members for their service. With no further business, the meeting was adjourned with a motion by Elaine Wilson and seconded by Patti Phillips. ← December 2018 Book Sale!